You might find it surprising that this quintessential Viennese schnitzel is probably the most commonly made lunch or dinner, without fail, at every household in Israel. While falafel and schawarma are consumed out at the fast food hole in the wall, schnitzel is usually made at home. Schnitzel was brought to Israel by Ashkenazi (Eastern European) German Jews. Schnitzel is probably the most popular Ashkenazi food in Israel all across the many ethnic groups, the melting pot that lives there. I am not sure, but I suspect, veal wasn't widely available in Israel way back when, so the recipe was and still is made with chicken breast. It is traditionally fried with butter, but because of kosher laws, forbidding mixing milk and meat together, it is fried with vegetable oil in Israel. I have been playing with 'oven frying,' as I dubbed it, instead of standing by the stove frying batch after batch. While these chicken wings at higher temperatures 'oven frying' are perfection, not so much with chicken breasts that tend to dry out. Some swear by shorter cooking time, approximately 15-20 minutes at higher roasting temperatures, 450F for chicken breasts. However, the results, the texture particularly, didn't appeal to me, though I gave this high roasting method a go on multiple occasions. I found that 350F works well for these cutlets. Traditionally these cutlets are breaded with flour. In Israel they are breaded with either flour or ready-made bread crumbs. On my most recent trip to Israel, I saw my sister 'bread-crumb' the schnitzel with panko which was brilliant. She fried the schnitzel though. Slice each chicken breast into 3 smaller slices. Pound it gently (few seconds) with a meat tenderizer, with plastic wrap or Ziploc bag on top of the chicken, until you have thin cutlets. Whisk the eggs together with a couple pinches of paprika black pepper and salt. Mix panko with paprika, black pepper and salt. Dip each cutlet in whisked eggs first, then coat it with panko and lay on the cookie sheets. Bake for 15-20 minutes until lightly golden. Flip with a heat resistant spatula, sprinkle the pan with 1 and a 1/2 teaspoons of oil, swish the flipped schnitzel in the oil and bake for 5-10 minutes longer. 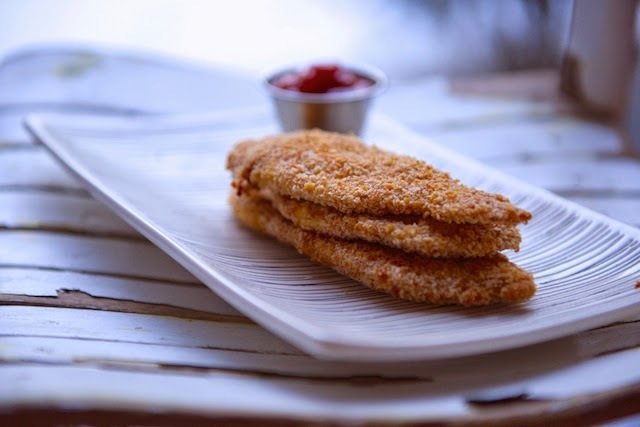 Serve the schnitzel with ketchup and a side dish of potatoes and other veggies or make school lunch sandwiches with it. Scrumptious looking and healthy! A wonderful idea. This sounds so amazing. Now I'm hungry!! I've never had schnitzel before!! I have to try this chicken dish! 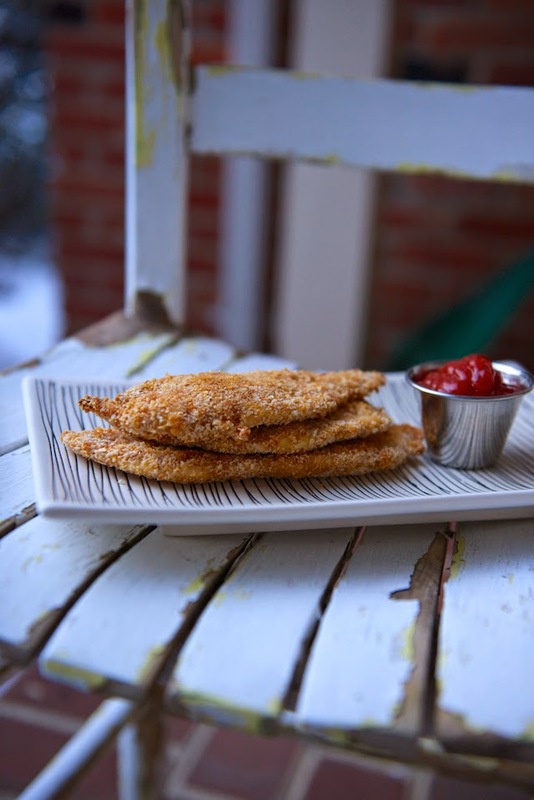 We love using panko on our chicken cutlets...it's the perfect light and crunchy coating! I love schnitzel and had no idea it was popular in Israel. This post was really interesting! That's interesting! I didn't know schnitzel was so popular in Israel. And your version looks great! great idea. I had no idea how popular it was. 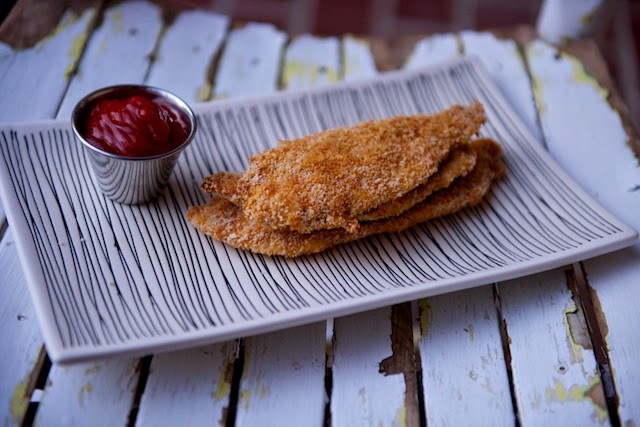 I've never has chicken schnitzel - what a fun idea! (We don't eat that much meat). It's so interesting to learn about the cultural differences (and misconceptions). Your recipe looks great! That looks absolutely amazing!! Brilliant idea, Shulie! I love it fried, but this looks every bit as good as any fried one I've ever eaten. Schnitzel is a favorite with everybody in my house, so I have to try this. Delicious! I had no idea schnitzel was popular in Israel. And yes, the panko is genius! I've never oven fried chicken breast for fear they would dry out. I'm trying your recipe! I had no idea that schnitzel was something they ate in Israel! I love the idea of doing it with chicken (I normally have it with pork) and the panko crumbs looks perfectly crisp! The crunchy coating on your chicken looks amazing!